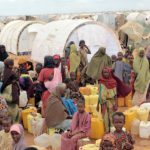 We offer a counter-analysis to “EU Militarizes Africa to Halt Migration” that appeared on Strategic Culture Foundation.1) While the original article offers an interesting study of the latest neo-imperialist military involvement of European countries in Africa, spearheaded by French President Macron, we beg to differ on what is going to be the impact on migration flows and what are the EU goals. Recent events suggest a rather different conclusion. Let’s go in order. Last summer, when the news that NGOs were shipping migrants to Italy and cooperating with traffickers surfaced, the newly elected Emmanuel Macron quickly came up with a solution: hotspots in Africa where people seeking protection could go to and apply for the status of refugee,2) and, if granted such a status, could be moved to Europe in an official way. The plan has been operational for a few weeks now: the first batches of positively-verified asylum seekers have been moved to France3)and Italy,4) while European governments are sending their troops to Africa to help manage the flow. The first groups come from the most afflicted area, Libya, due to its lack of a stable government, ironically resulting from French intervention of a few years ago, when the “Arab Spring’’ brought about the removal of Muammar Qaddafi, leaving the country in a state of perpetual civil war. After the Italian government had partially (up to 6,000 migrants every month are still shipped to Italy5)) sealed the Libyan route, those who couldn’t make it found themselves trapped in the North African country and NGOs started lamenting human rights abuses and slave markets in development. The process is referred to as “humanitarian corridors’’ and is lobbied heavily by the open borders civil society groups. Asylum seekers whose request is accepted are transferred to their destination, while those whose request was rejected are moved back to their home country. Finally, last week, on the occasion of the ‘’International Migrants Day,’’ the EU Commissioner for Migration, Home Affairs and Citizenship Dimitris Avramopoulos penned an article for Politico,6) expressing his commitment to open borders migration policies and outlining the EU’s role on the matter: the flow will not be stopped, but managed. 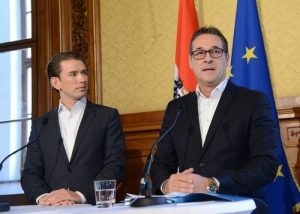 Austrian government between the recently elected Sebastian Kurz and the far-right Freedom party (see image); however, the EU establishment finds that such popular rejection of their policies is unjustified, coming from ungrateful people who do not see the bigger picture, who fail to appreciate the alleged benefits of vibrant and diverse multicultural societies, or are simply misguided by populist politicians or fake news from Russia. The commitment to free movement of labour, a key component of modern liberalism, combined with that of capital and goods, remains, while the approach has changed. The Marie-Antoinettes of the liberal elite realize that the Brexit vote might have been partially instigated by the human flows following Merkel’s decision to open European borders to Syrian refugees. But according to them, the problem isn’t Merkel’s policy, it’s the mediatic impact of the human waves or the migrant boats in the Mediterranean, creating a fear among Europeans that they were being overrun. 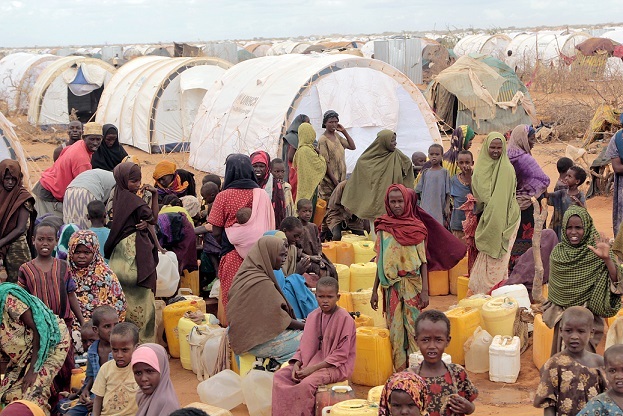 The new approach of humanitarian corridors aims to continue the flow; however, it will be meticulously organized, in theory barely noticeable to the view of the public. Migrants will keep arriving, not on foot or by boat but by plane. The liberal elite wants to prove it can solve problems without compromising its values. The plan resembles the one adopted by Merkel with the agreement with Erdoğan. While the human wave stopped, hundreds of thousands of Syrian refugees have been flown to Germany since then. Liberal leaders are convinced that immigration is not a problem if managed in an orderly way, and that the anxieties of European citizens will go away if the media covers the topic correctly. We are sticking to the effectiveness of Merkel’s policy, since it’s the only precedent. And the answer is no. Germany has already found out the hard way that integrating hundreds of thousands of people in such a short time is impossible, economically and socially. Merkel started early this year the ‘’Joint Way Forward’’ scheme to return Afghan refugees to their home country, but even returns have turned out to be problematic, with pilots refusing to fly over safety concerns. The economic costs keep rising, and now the German government is looking for ways to send Syrians back to their homes as well,7) much to the consternation of open borders advocates. voters knew her and what they could expect from her, but it didn’t turn out that way. After this year’s election, Merkel is currently unable to form a government after losing a significant number of votes to the anti-immigration AfD. The ‘’Jamaica coalition’’ idea with the FDP and the Greens failed. Negotiations with the SDP are stalling. New elections would force her to relinquish power; the liberal elite had chosen her as the new ‘’leader of the free world’’, a nominal role uniquely attributed to US Presidents in the past, out of rejection of Donald Trump, but it looks like they are going to need a new one as well. Predictably, it’ll be Macron and he’s already well on his path to repeating the same mistakes. Merkel’s attempt to quell dissent by enacting a number of censorship laws on social media has not worked either. The problem isn’t the media, nor the allegedly unjustified criticism by Europeans; the problem is her policy. that the flow was not compatible with its integrating capabilities, ranging from housing, to education, to social stability, it did reinstate controls to the border with Denmark to limit any further influx from the Third World, with the minister of a left-green coalition government announcing the measure in tears.8) More recently, the Swedish Finance Minister admitted that ‘’integration isn’t working’’ 9) and immigration costs for Sweden are unsustainable. Avramopoulos’s truth might as well be a lie as we are shifting in the Orwellian phase of liberalism, where every word means the exact opposite. The flows envisaged by the EU chief have already proved to be unsustainable; if he doesn’t have the will or the power to stop them, someone else will do it, without the need to give up on humanitarian assistance. Can humanitarian assistance coexist with the necessity to curb migration flows to Europe? Instead of funding UN/UNHCR/IOM schemes to fly refugees to Europe, an alternative could be to create protection centers in stable neighbouring countries. If there’s a conflict in Eritrea, for example, then the EU, European countries and the rest of the international institutions could offer additional aid to neighbouring Ethiopia in exchange for setting up centers for refugees and offering protection locally. If the crisis is in Sudan, then centers could be set up in the Central African Republic, or Chad, or Kenya, or the Democratic Republic of Congo. Individuals needing protection will actually be closer to the place that can protect them, without needing to travel to Libya or other North African shores. The cheaper costs would allow taking care of bigger numbers. Once the emergency is finished, it’ll be easier to return to their home countries. Family reunions would be easier as well. Finally, it’d prove to Europeans that leaders listen to them and reconcile the masses and the elites by providing a solution on an extremely divisive issue. 1. ↑ EU militarizes Africa to half migration, Strategic Culture Foundation 2017-12-23. 2. ↑ Macron wants asylum claims to start in Africa, EUobserver 2017-08-29. 3. ↑ Flüchtlinge werden aus Afrika direkt nach Frankreich gebracht, Die Welt 2017-12-18. 4. ↑ UN evacuates refugees to Italy from Lybia for the first time, Reuters 2017-12-22. 5. ↑ Cruscotto Statistico, Ministero dell’Interno 2017-12-22. 6. ↑ Europe’s migrants are here to stay, Politico 2017-12-17. 7. ↑ Germany is preparing to send refugees back to Syria, Foreign Policy 2017-12-6. 8. ↑ Sweden’s deputy prime-minister cries while announcing refugee u-turn, The Guardian 2015-11-24. 9. ↑ Integrationen fungerar inte som den ska, Dagens Nyheter 2017-12-21. 10. ↑ Refuge: rethinking refugee policy in a changing world; Alexander Bettis, Paul Collier 2017, Oxford University Press.